Happy with par at Zurich Kodak Challenge Hole #17? 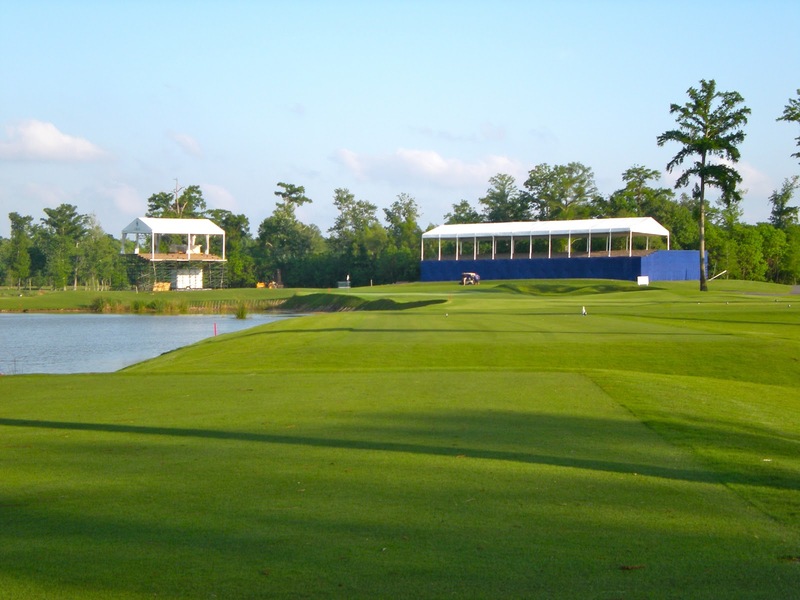 Although there have been a few aces in the history of the 215-yard 17th golf hole at TPC Louisiana, many golfers at the Zurich Classic consider this Kodak Challenge hole to be a very long and difficult par-3. Darron Stiles may have used a 7-iron to ace the 17th hole in 2005 with Daniel Chopra needing a 5-iron to do the same in the final round of the 2007 New Orleans Zurich Classic but the vision of water and newly reshaped green may be problematic for the players. 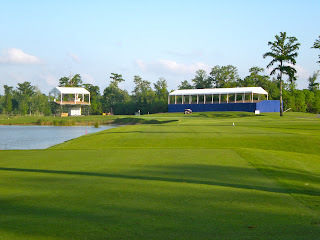 Tournament Director Rommy Fonseca conveyed about TPC Louisiana's Hole #17, "This is a unique hole that has proved very challenging for the players. It has also provided some great play over the years." "...giving Dye the opportunity to move some bunkers around, redesign the green and generally make it hell for everyone who dares to gaze upon it from the tee box. Last year, the hole was ferocious, ceding just 38 birdies against 85 bogeys. The 17th claimed another 26 double-bogeys or worse. With a scoring average of 3.23, par will be considered a victory." "This was clearly a different hole from the TOUR Tees than our tees. From our tee box there was almost no forced carry over the water which runs down the left side of this hole. If you miss the green left, you're wet. A tee shot right and you're left with a chip shot to a green running away from you. It's a long green and a back left pin placement makes this hole more challenging. 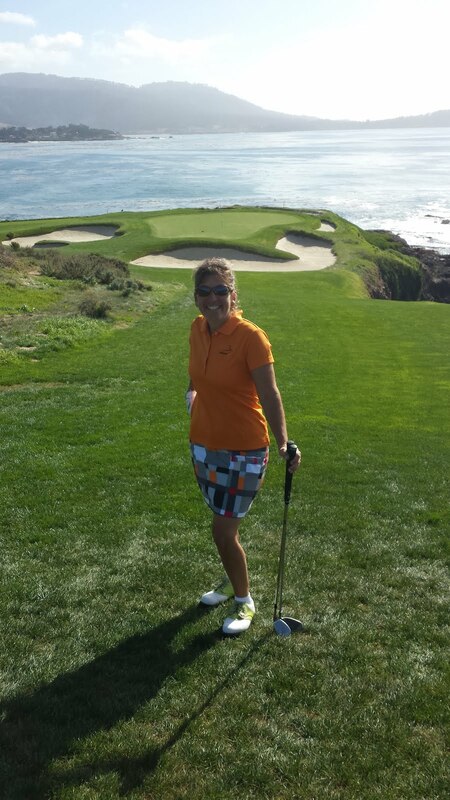 I was fortunate enough to hit the green in one and then three putt." Luke Donald, looking for a way to win the Zurich Classic this weekend and take the number-one spot in the OWGR from Lee Westwood had a different version of the hole, saying a birdie at 17 during the opening round helped him to get back on track. Will the wind wreak havoc this week at the Kodak Challenge Hole #17 or will one of the PGA Tour players ace the hole creating a Kodak moment? The Kodak Challenge highlights many of golf's most exciting and picturesque holes in 2011 as players take on "the greatest scorecard in golf." Created to celebrate the beautiful holes and memorable moments in golf, the Kodak Challenge is a first-of-its-kind competition on the PGA TOUR. Players must play at least 18 of 30 Kodak Challenge holes throughout the season to qualify. The golfer with the best Kodak Challenge score relative to par at the end of the season will win the Kodak Challenge trophy and $1 million dollars. Should a golfer be number-one without a major? Type "World Golf Rankings" into Google and you will be exposed to less-than-positive perspectives ranging from "unimpressive" to "who cares?" How important are the World Golf Rankings and to whom? John Feinstein, a contributor to GolfChannel.com writes, "in a pure golf sense, the world rankings are used to determine who gets into major championships, who gets into lucrative World Golf Championship events and, in the case of the WGC match play event, the rankings determine the seeding of the 64 players." “Ranking Points”, according to the Official World Golf Ranking website, "are awarded according to the players’ finishing positions and are generally related to the strength of the field. 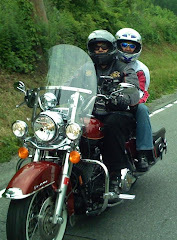 The four Major Championships are rated separately to reflect the higher quality of the events." Points span a two-year "rolling" period so Tiger Woods' with his big point spread was able to remain in the top spot during most of the 2010 season despite not winning an event all year! Cause for concern? Now that Woods has finally "released his stranglehold" from the top spot of the OWGR, a shuffling of golfers has allowed the rankings to truly become more global. However, as soon as one player wins, another takes his place. Is this constant shift good for the game and the fans? Lee Westwood, tagged as the latest 'golfer never to win a major', regained his number one status on the OWGR last week with a win at the Indonesian Masters. An appearance fee of $500,000 tempted him there but the only player with a top-50 ranking at the event certainly made it easier to climb the rankings with a good showing. Although Westwood's victory was worth twenty world ranking points, Luke Donald had to win in order to become the world number-one. The points awarded at the Indonesian Masters was the same amount as a third-place finish at The Heritage, the PGA Tour's stop last week. Is too much emphasis being placed on points? Should points or the fans determine who should be number-one golfer in the world? With the shuffling of the OWGR three times since the end of 2010, golf writers and fans are now waking up to the fact that this rating system needs to be scrutinized and adapted for a global environment: perhaps a voting system to take into account appearance fees, two-year accruable points and other basic "common sense" issues. Whereas Feinstein believes that "golf experts" should have a say, should a voice also be given to the avid golf fan, the publinks golfer, and golfers new to the sport and to whom the sport is trying to entice to grow the game? The number-one golfer in the world used to be recognizable: not knowing the names on top of the World Golf Rankings could hurt viewership with no real hero to talk about or cheer onward. Perhaps a golfer should not even be considered for the number one spot unless he has at least one major in his professional career? The top five players in the World Golf Rankings this week are: Westwood, Kaymer, Donald, Mickelson and McDowell. Mark Paul, a fan who added his thoughts to Yahoo Sports, received the top spot in Google Golf News for the term "World Golf Rankings" this week. He questioned, "how impressed should golf fans be by these rankings?" "Lee Westwood, Martin Kaymer, and Luke Donald," Paul stated, "are all within percentage points of each other. However, it is easily the least impressive top three in the history of the rankings." Ron Furlong in his Bleacher Report column asked "Who Cares?" calling the World Golf Rankings title "make-believe." "In the end, the rankings mean very little to nothing. In fact, the rankings often don't even depict who the best player in the world is." So, in fact, with so much buzz circulating about the rankings in the world of golf, it should be determined that they are a big deal. If you could pick the number-one golfer in the world, who would you choose? Do you agree with the current rankings? Tiger Woods' flat blade may not be earning much money for either the former number-one golfer or his Foundation so it is up to Tiger Jam 2011 to make up the difference. On April 30th, Mandalay Bay in Las Vegas and Woods will host the thirteenth annual Tiger Jam. Last year, the Charity Concert did not take place as Tiger sorted out his domestic life issues. The "exclusive VIP" fundraising "Jam" has raised $12 million to date for the Tiger Woods Foundation and features some of the best musical talent on the planet. This year Grammy award winning artists John Mayer and Keith Urban will rock the house with a blend of country, rhythm and blues. Before the Concert, Tiger Jam features dinner and a silent auction "filled with a vast array of unique experiences and luxury items from entertainment personalities and sports teams, fine jewelry, spectacular resort getaways and one-of-a-kind experiences." "I'm thrilled these two talented musicians are joining us for Tiger Jam," Tiger Woods said. "We have had so much success with this event over the last thirteen years and we are excited to continue that tradition." Tickets (starting at about $70) are still available for the Concert through Ticketmaster. A limited number of sponsorship packages are available ($1,000) which include access to the Concert, a Tiger Jam Reception and House of Blues Party where you might even catch Tiger Woods busting a move. What has Tiger Woods been up to when not playing golf on the PGA Tour? Could he be gearing up to re-invent himself as the new PING-PONG champion in China? Check out this seven second video on the Tiger Woods website in which Woods' backhand goes up against Chinese Olympic gold medal hurdler Liu Xiang. "Great day hanging out with Liu Xiang in Beijing, really cool dude. Hope he does well in London games next year." 12 days ago on Tiger Woods' Twitter page. The golf world went a-twitter yesterday as Tour Pros caddied for a cause at the annual PGA Tour Wives Golf Classic at Sea Pines Resort in South Carolina. Hosted by The Heritage, the goal of the friendly 9-hole shootout was to raise over $100,000 for charity. Hilton Head Heroes in South Carolina will receive half of this week's bounty with remaining donations distributed by the Association. Among the notables, Jason Day drove the golf cart for Ellie and Pat Perez looped for wife Athena (@athenaperez12). Yfrog and Twitvid were "off-the-grid" busy, with up-to-the minute updates to record all of the action. Do the ladies have game? PGA Tour Pro Bobby Gates' wife, Lauren Gates @LmjGates "cleaned house" winning (as mentioned by @stallingsgolf) "all the prizes in the PGA Tour Wives golf tournament" which were "the closest to the pin prize with a great 4-iron and then the longest drive." His team finished "a mere 9-under thru 9-holes." Although Kimberly tweeted that she had a fun day playing golf with her husband, when she told him, "We should start playing together for kicks, Brian said, "Probably not." Plaid and argyle will probably now make a "statement" on the PGA Tour, especially since the winner is awarded a plaid jacket, but I think the pattern definitely is more appealing on the ladies! 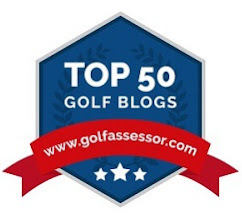 Read Golf for Beginners blogs by clicking here. Although I rarely have reason to flip through testoterone-laden magazines such as Men's Fitness, after hearing that a section was dedicated to improving aspects of the golf game, I took a look. Yes, there are plenty of "buff" males in the May 2011 issue but I kept focused on the task at hand, thumbing through the pages until I came across the golf tips. After passing segments entitled "Gut Check", "Fast Lane" and the "Cardio Workout from Hell", I came upon Rickie Fowler dressed in bright green golf clothes and three pages jam-packed with golf exercises, tips and tricks designed to transform "lifters" into "players". In MF Golf '11's "Own the Green", Scott Riehl offers up a golf-specific training routine to help improve balance while working the torso. There are also quick fixes if you're tight or erratic. Camilo Villegas' tip, "I don't care what position your club is in, you have to be able to repeat the same motion over and over." The segment which I enjoyed the most was "The Clinic", where a few better-known PGA Tour golfers shared their do's and dont's for warm-up and during the round. Zack Johnson, the 2007 Masters Champion offers, "When you warm up, hit twenty to twenty-five wedges, a few middle irons and ten to fifteen 3-woods and drivers," giving yourself ten minutes to putt. Johnson also mentioned that the secret to regularly hitting crisp chip shots and maintaining solid distance control is by keeping your hands in front of the golf club. "That's how the club is designed to be struck," Zack mentioned. "The only time you let the club past your hands is on a flop shot...when you're hitting sand or turf below the ball." That being said, the golf section was okay but, if you want to read magazines about the sport, stick with Golf Digest or Golf World. After watching the dramatic finish of The Masters, I couldn't help but feel a longing for more visions of Augusta National Golf Course. The azaleas in bloom, the walk through Amen Corner, the history that surrounds this golf mecca has me wishing the first major of the season was just beginning and not at an end. For book lovers who also wish to prolong the magic of The Masters golf tournament, John Coyne has written "The Caddie Who Won the Masters " a suspenseful novel about a middle-aged amateur’s seemingly impossible quest to win the prestigious Masters at Augusta National Golf Club. Although this very brief synopsis cannot do the book justice, it may entice you add this to your summer reading list. A college English professor from Southern Illinois reawakens a dormant golf game that had earned him a scholarship to Wake Forest University and, more recently, a ticket to Augusta, Georgia. With suitcase in hand and golf clubs on his shoulder, the aging muni-course player finds himself walking down famed Magnolia Lane toward every accomplished golfer’s dream—a coveted spot alongside the world’s best players in the Masters field. Seven-time bestselling author and creator of the highly acclaimed caddie novel series that includes The Caddie Who Knew Ben Hogan, The Caddie Who Played With Hickory, and the newly released The Caddie Who Won The Masters, former caddie and caddie master John Coyne has authored more than twenty-five books of fiction and nonfiction. The New York author also maintains a single-digit handicap and tries not to lose distance off the tee! In his most recent blog, "Our first "Homebred U.S. Open Golf Champ, Johnny McDermott", John Coyne mentions that he collects stories about great players from the past; stories from when golf was more of a game, less of a television show. The same is true with "The Caddie Who Won the Masters" as Coyne's style uniquely blends his deep knowledge of golf and Masters tradition with his affinity for the supernatural to spin a riveting tale. The Caddie Who Won the Masters is available at Amazon.com and downloadable on your Kindle. I entered into a Masters Pool in which I had to assemble a "dream team" of eight golfers: if my "team of eight" racks up the most prize money, I win the golf pool. Although I cannot say who started the pool, I can show you who I chose as my top finishers (not in any particular order). As an interesting note, twenty entries out of fifty-four did not include Tiger Woods which is this particular golf pool's record. Here is my dream team of top money winners with quotes relating to how they feel going into The Masters. 1. *Phil Mickelson: After shooting weekend 63-65 win the Shell Open. 4. Hunter Mahan during par-3 contest, talking about Palmer, Nicklaus and Player, It doesn't get better than these legends!! 5. Dustin Johnson: "I've had a few opportunities to go play (Augusta), just a casual round. 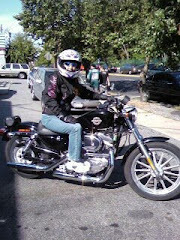 I didn't really want to because I wanted to earn my way into it." 7. Ryo Ishikawa: "My goal is to be in contention here at Augusta National," Ishikawa said Tuesday, after being grouped with three-time major winner Padraig Harrington and Bill Haas for the first two rounds. ‘‘But I don’t want to just contend. I want to fight it out with Woods for the title some day." 8. K.J. Choi: "I just need to be 100 percent focused to the very last shot and the last hole on Sunday and stay patient," said Choi. "There's no room for small mistakes and I'm not just referring to the shots you hit on the golf course. The Masters is more than that. I failed to do that last year during the final round." Choi finished in 4th place at the 2010 Masters. What are the odds that Mickelson or Laird will don the Masters Jacket? Two weeks ago I wrote an article about how the next Masters champion may come from a win at either Bay Hill or Redstone based upon what I believed to be circumstances of "fate". With Mickelson coming from behind to win at the SHO this week, a green jacket reality moment at Augusta National is settling in with oddsmakers as well. There have only been six instances since 1960 when a player won an event either one or two weeks prior to winning the Masters. It's happened just twice since 1990 and in five year increments: Tiger Woods in 2001 (The Players Championship) and Phil Mickelson in 2006 (won the BellSouth the prior week). This next five-year increment is at hand and so it stands to reason that either Mickelson or Martin Laird could become the 75th Masters Champion. Humble Phil feels confident after a SHO-ing this week that he can win the first major of 2011. "It feels really good for me to have played well and gained some momentum heading into next week," Mickelson said. "I needed to have a week where I kind of put it together." But even Mickelson mentioned after his round that there were a few holes in which he lost "focus". Focus and rolling in the putts are the keys (in my opinion) to winning any golf tournament. If in fact rolling in the putts is any indication of a win, then according to Colin Montgomerie, Laird has the potential to be a "world star." Monty said, "He (Laird) had a putting lesson from Dave Stockton and it's clearly worked because if you saw those last four putts he holed at Bay Hill, every one was dead centre. If he can putt half as well as that at Augusta he has a chance." In spite of Montgomerie's "cooing" over Laird's ability on the golf course, Mickelson's odds currently stand at 5-1; Laird's odds are at 66-1. Angel Cabrera (2009), Trevor Immelman (2008), Zach Johnson (2007) or Tiger Woods (2005). As in past years, live coverage of the Masters Tournament, April 4-10th, will be available from Amen Corner holes No 15 & 16, the Practice Range and the par 3 contest on Masters.org. Opine with Golf4Beginners on Twitter. "Autism is a developmental disorder that appears in the first three years of life and affects the brain's normal development of social and communication skills"
Although Ernie Els speaks out for Autism in the golf community, the world of sports will be joining forces to officially kick-off Autism Awareness Month. To shed light on the fight against autism, sports landmarks across the country will illuminate in blue April 1st and 2nd as part of Autism Speaks’ Light It Up Blue campaign (LIUB). Light It Up Blue, now in its second year, has garnered the support of over three-hundred iconic buildings and landmarks across the globe. These structures will illuminate in bright blue to shine a spotlight on the growing autism health crisis, which now affects one in one-hundred and ten children, and one in seventy boys. Additionally, the NBA will show its support of the Light It Up Blue campaign, as broadcast teams will sport Autism Speaks pins at all nineteen nationally and locally televised games on April 1st and 2nd. The NBA has created PSAs with NBA superstars like Dwight Howard, Chauncey Billups and Deron Williams to be broadcast during those three games as well. Other celebrity events raising money to find causes and a cure for Autism include an auction that last year secured almost $10,000 to fight the neural disorder. This year, Yoko Ono's signed Lindt gold bunny seems to be all the rage. The Els for Autism Golf Challenge takes over right after Autism Awareness Month officially concludes with a national amateur golf competition that combines challenges on well-known courses like Doral with its fundraising efforts. The first event in the Challenge begins on May 1st in Florida and concludes in October in Las Vegas.